Jurgen Klopp's side returned to top spot with a win on Friday night. 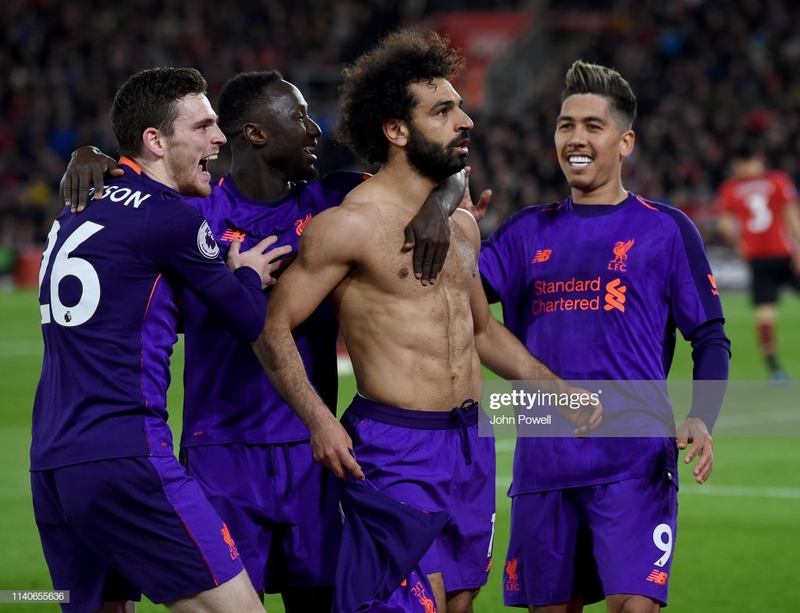 Liverpool surged to a 3-1 win at Southampton on Friday night, sending another warning signal to Manchester City that they refuse to lie down in the ongoing Premier League title race. While Pep Guardiola's side remain in charge of their own fate, this was the latest testament to the will and power instilled by Jurgen Klopp. How much more drama can one take? How many more twists and turns will this title race deliver? This looked the killer blow. This looked like it could be game over. It wasn't. When Liverpool went a goal down inside the opening ten minutes, it threatened to be a painstaking moment in the title race. Hasenhuttl's side have been on an upward trajectory, bagging wins against Everton, Spurs and Arsenal in recent weeks, and a fast start suggested they could deliver a critical twist to the ongoing Premier League title race. Indeed, it was another troublesome start for Jurgen Klopp's side, who were second-best to every ball, with the home side showing exactly why they'd taken three points off of top teams. Yet, the scores would be level going into the half-time interval, with Naby Keita grabbing his first Liverpool goal since joining from RB Leipzig. Returning to the starting line-up after two months out of favour, the midfielder's effort gifted The Reds a lifeline their performance didn't deserve. The pattern of the game would prove to be the same for the second-half, with the scores locked at 1-1 in the 80th minute. his was crunch time. A draw would've given City valuable breathing room in the title race, able to establish a three point cushion with just a handful of games left on the board. The Egyptian has come under heavy scrutiny in recent weeks, having gone eight games without a goal. This was the perfect time to break the duct; surging forward in possession fifty-yards before curling the ball into the bottom corner, Salah's solo effort could yet prove to be a crucial nail in City's coffin. At the very least, it echoed the powers of recovery that Klopp has engrained into his side over the last year. Whenever they've looked down and out, Liverpool have found a way to recover. They've found a way to get over the line. This was no different. Salah's dazzling run would provide the impetus for another sublime second-half revival, with the introductions of Jordan Henderson and James Milner providing pivotal in a resurgent performance. The skipper's effort to make it 3-1 was met with a visible sigh of relief from supporters and players alike - one more game won, one more hurdle cleared. It looked for all the world like Liverpool would come unstuck at St Mary's. The home team were purring and in the ascendency while Jurgen Klopp watched on pondering his options. In need of some inspiration, Mohamed Salah stepped up to end his goal drought at the perfect time, entering the record books as the fastest player in Liverpool's history to reach 50 goals, running from his own half before curling an intricate shot into the far corner. Southampton 1-2 Liverpool. This was Mo Salah's moment. Friday's win sees Liverpool already three points ahead of the tally that won them the league in 1990, with the current crop on course to surpass the club's best ever points tally in the top flight. And yet, for the first time in history, a total of more than 90 points may prove to be nothing more than a conciliation prize, such is the unprecedented nature and quality of this Manchester City side. Yet, for all the clamour about how Liverpool may miss out despite such a mouth-watering season, their last two games have delivered an equally potent message. Jurgen Klopp's side refusal to be down and out must come as a huge blow to City. It looked like they'd drop points to Spurs, they didn't. It looked like they'd drop points here, they didn't. The Reds have kept on fighting in the face of adversity and Pep Guardiola's will be feeling the pressure with only a handful of games to come. This Liverpool side aren't going down without a fight - he best be up for one.